This costumed character was created by J. Bone and was part of a set of characters appearing in True Patriot. The stories are lighthearted and humorous. There is an ecological flavour to them. In Grey Owl vs. Big Foot a Sasquatch type creature who it turns out is an alien, Grey Owl tries to rescue a turtle from it, except that it is also trying to rescue the turtle. In the second story the villain if you can call her that is “Bee-Dazzler who thwarts Grey Owl with the help of her bees (who don’t sting) and pollen. Grey Owl solves the case through a beautiful play on words using alliteration, and renders Bee-Dazzler’s bees ineffective by distracting them with plants whose names begin with “B”. The final story sees Grey Owl counseling Tundra of the Family Dynamic. There is no origin story but it would be nice to think that J. Bone when creating this character was inspired by Archie Belaney who in the persona of “Grey Owl” was one of Canada’s earliest environmentalists. 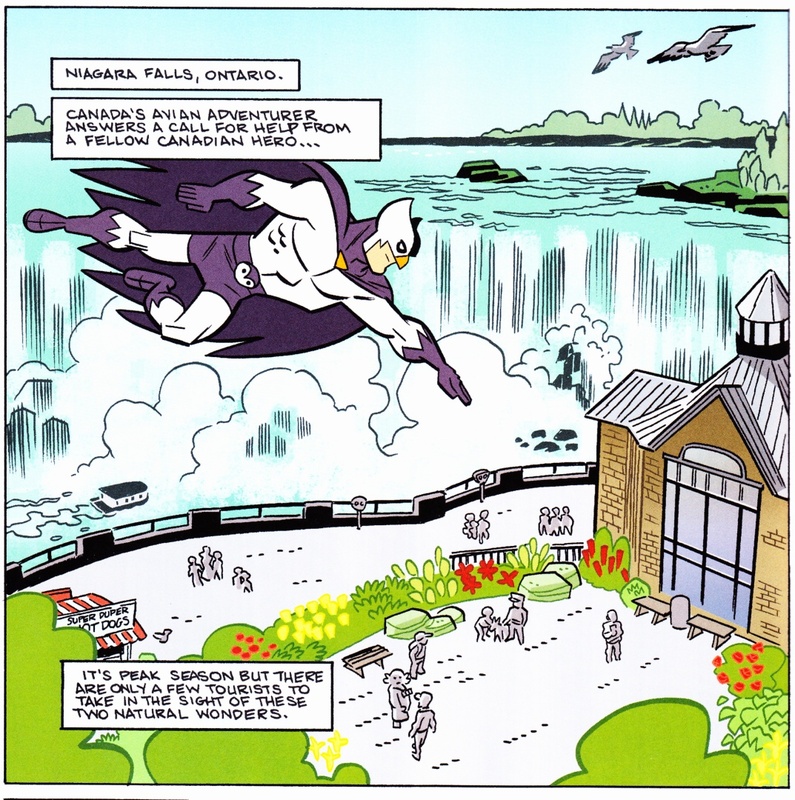 “The Grey Owl vs. Bigfoot.” Car., J. Bone.True Patriot: All New Canadian Comic Book Adventures. Ed., J. Torres. True Patriot Comics, 2013: 33-41. “The Grey Owl vs, The Bee-Dazzler.” Car., J. Bone. True Patriot: Heroes Of The Great White North. Ed., J. Torres. True Patriot Comics, 2014: 39-44. “Grey & Family Dynamic: A Lesson In Thunderland.” Writ., J. Torres. Illus., J. Bone. True Patriot Presents, 1, Nov. 2016. “A Lesson In Thunderland.” Writ., J. Torres. Illus., J. Bone. True Patriot, 1, Nov. 2016.